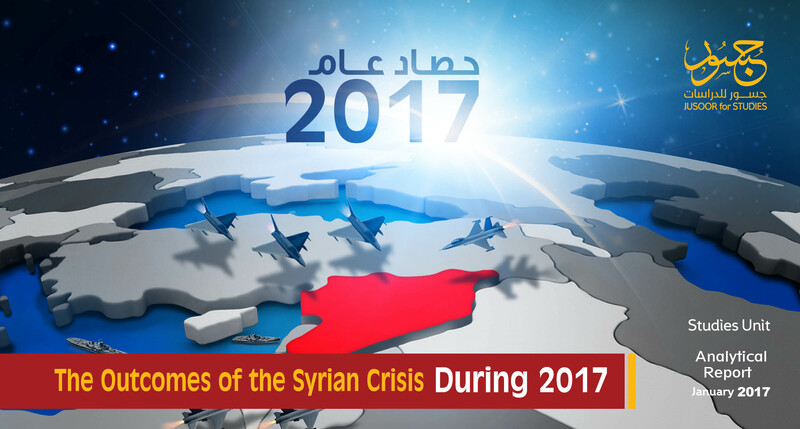 The year 2017 has witnessed dramatic changes in the Syrian arena after many years of stability between different forces and actors. The three regional actors (Russia, Turkey, and Iran) have been the key players during 2017, whilst the American role has declined in Syria. On a national level, the Syrian Democratic Forces (SDF) and Assad’s forces have expanded their military influence at the expense of the Syrian opposition along with the dramatic collapse of ISIS who had, at the beginning of this year, controlled the largest part of Syria for the past three years. There is no doubt, that the current outcomes, achieved by the regional and local actors, are considered the harvest of the past years, which have enabled them to achieve gains or obtain political losses related to the field. This report analyses the political and military outcomes of 2017 and tries to read into the changes that occurred in the positioning of actors during this year, in addition to anticipating the military and political tracks in 2018. Many changes have taken place in the military influence map in Syria, as Assad’s forces had expanded their military control dramatically. The percentage of regime-controlled land increased intensely from 20% in early 2017 to more than 50% end of the same year. In addition to the expansion of the regime, the Syrian Democratic Forces (SDF) have also expanded their military influence to 25%. On the other hand, ISIS has lost about 45% of its controlled areas and the recent military influence is now below 7%. Furthermore, the military influence of the Free Syrian Army (FSA) has slightly declined and has become 13%, after it used to control more than two-thirds of Syria at the end of 2012. In the first quarter of 2017, Turkey continued the “Euphrates Shield Operation” and was able to gain control over the city of Al-Bab on Feb.23, 2017. The Turkish National Security Council declared the end of this military operation on March 29, 2017. In the final quarter of 2017, the Turkish Armed Forces (TAF) entered the Idlib Province, but this time as a monitoring force as had been agreed with Russia and Iran in the Astana agreement. Contrary to expectations, no conflicts took place between TAF and HTS (Al Nusra Front previously). Rather, the Turkish troops were protected by HTS combatants and TAF did not enter any cities or towns in the Idlib Province or even interfered with the working mechanism of the military factions or institutions. TAF’s rejection to implement the Astana agreement with regards to the establishment of 12 Turkish control points in the Idlib Province, has caused Russian airstrikes to target this province in November 2017, in order to pressure Turkey into fulfilling its obligations under the Astana agreement. Despite what has been said that Turkey and Russia have reached an understanding in the last round of the Astana course in regards to the deployment of Turkish troops in the rest of the agreed on areas, the implementation of this deployment did not take place until the end of 2017. The Battle of Raqqa was the most significant event of 2017, as it had not only occupied the attention of the political spheres in the area but has gotten the attention of the whole world since the beginning of 2016. This is due to the reason that Raqqa city used to be the capital of ISIS in Syria and the importance of the city has increased after ISIS lost control over Al Mosul city in Iraq midst 2017. On June 6, 2017, The Syrian Democratic Forces (SDF), backed directly by the international coalition declared the start of the battle of Raqqa and was able to gain control over the city center on October 17, 2017. The end of the battle of Raqqa was marked by two main events: The first one was the raising of Abdallah Ocalan’s picture by the SDF on the Naeem Roundabout in Raqqa City, which discredited all American allegations about the absence of any relation between the Democratic Union Party (PYD) and the Kurdistan Workers Party (PKK), and even presenting the SDF as a trans-national entity. The second event, was the sudden withdrawal of ISIS from the center of Raqqa city under the protection of SDF and the International Coalition, which raises a question about the upcoming destination of the withdrawing combatants and the agreement that took place between ISIS and SDF. The course of Astana negotiations started in January 2017, while its 8th round ended in the last month of the same year. During that time the Astana Course was able to stop the escalations, which impacted the ground by dramatically decreasing the death toll, despite of constant violations of ceasefire agreements. Contrary to the course of Geneva negotiations, the course of Astana had a more practical and technical nature, as military and security teams of the three guarantor states worked together on studying and dividing the Syrian map alongside distributing roles, in a complete absence of any de-facto Syrian participation, from the government or opposition factions. The role of Syrian actors is practically limited to adopting whatever decisions are reached by the three countries. Declaring the launch of the Sochi conference, during the last round of Astana negotiations, has left an impression that the military nature of Astana’s course will develop into a political one, and might be considered a replacement or a competitior to the course of Geneva, due to the fact that it possesses an effective military side, contrary to the course of Geneva. 2017 has witnessed the emergence of the Hay’at Tahrir Al-Sham Movement (HTS) which came as an important change for the Al Nusra Front, as opposed to the previous change. The formation of HTS has included new components which were not part of Al Nusra previously, and appointed a former commander of Ahrar Al-Sham, the main rival of HTS, to head the newly formed faction. But, HTS could not continue in the way it had started and had lost half of its new members to Al-Nusra, including the new commander, by the second half of 2017. HTS returned to its previous formation, similar to Al- Nusra, just with a different name and flag, and most importantly a new policy, namely working behind the scene rather than publicly and adopting pragmatic policies, thus conflicting its previous ideologies as Al- Nusra. The most significant action of this formation was the removal of the ISIS affiliated combatants known as “Jund Al Aqsa”, from Idlib and its surroundings towards Al Raqqa, after a series of fierce battles. Moreover, HTS launched a large-scale offensive against Ahrar Al-Sham, seizing most of the movement’s military assets and resources, thus rendering it weak and with almost no influence, after it had been considered one of the strongest military factions nationwide. The international coalition’s drones continued to target prominent commanders in HTS and other Islamic groups, whilst other assassinations took place by unknown gunmen against military and religious figures in HTS. During 2017, the political trajectory has remained the same in Syria without carrying any positive initiatives that can lead to a political solution in the country. The sole exception to this could be considered the invitation to hold the Sochi conference. Furthermore, no meetings were held among the American and Russian foreign ministers with regards to the Syrian issue contrary to previous years. Also, the Geneva negotiations did not make any progress in this regard. Trump’s administration, which came into power at the beginning of 2017, withdrew to a larger extend from the Syrian cause and focused almost entirely and exclusively on the Eastern and Southern zones in Syria. The USA, also decreased its level of diplomatic representation in all meetings related to the Syrian issue. However, the political declination of the American position has witnessed one major exception within the American policy towards the Syrian cause since its beginning in 2011, namely the bombardment of the “Shayrat” Military Airbase. This operation was undergone after Assad’s forces targeted “Khan Shaykhun” with chemical weapons, causing a massacre that caused the death of more than 100 people on April 4, 2017. But the bombardment of the “Shayrat” Military Base was not the only confrontation between the USA and the Syrian Regime. On June 18, 2017 the American forces shot down a Syrian aircraft that was trying to target sites belonging to the SDF near Tabqa city. The USA also targeted Iranian-backed militias several times in addition to military convoys belonging to Assad’s forces near Al Tanf. However, these military actions were understood as being messages related to the American- Russian agreement in regards to dividing the military influence in Syria, as opposed to being specifically against the Syrian regime. The Extention of the work of the International Inquiry Commission in regards to the Syrian issue has been a cause of conflict between Russia from one side and other international groups within the security council on the other. This conflict has caused Russia to use the Veto right twice to hinder the extension of the work of the International Inquiry Commission, before an agreement was reached at the end of the year that allowed for this extension. The declination of the American and European roles has caused the expansion of the Russian influence in Syria alongside the Turkish and Iranian influence, especially, after the withdrawal of significant regional actors such as Saudi Arabia and Qatar. 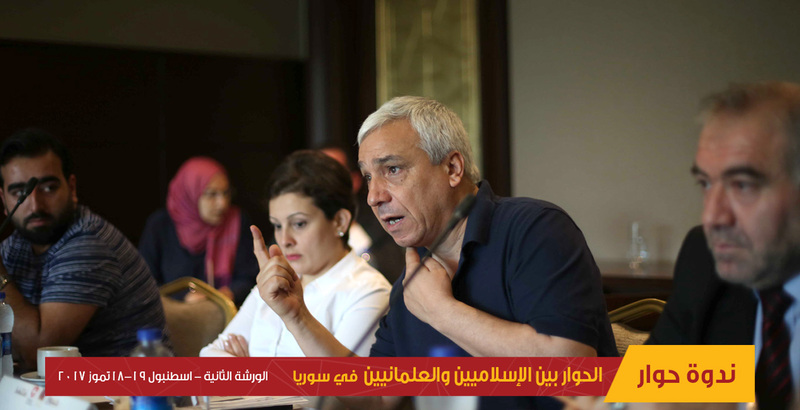 The second round of the Riyadh Conference was the only active step for the Syrian opposition, which has caused the end of the High Negotiation Committee (HNC) and the emergence of a new negotiation delegation with no previous institutional reference. On the other hand, this year has witnessed the considerable decline of the role of the “Syrian National Coalition” as a result of previous factors that have rendered its work weak, in addition to the withdrawal of many active actors from the Syrian scene. 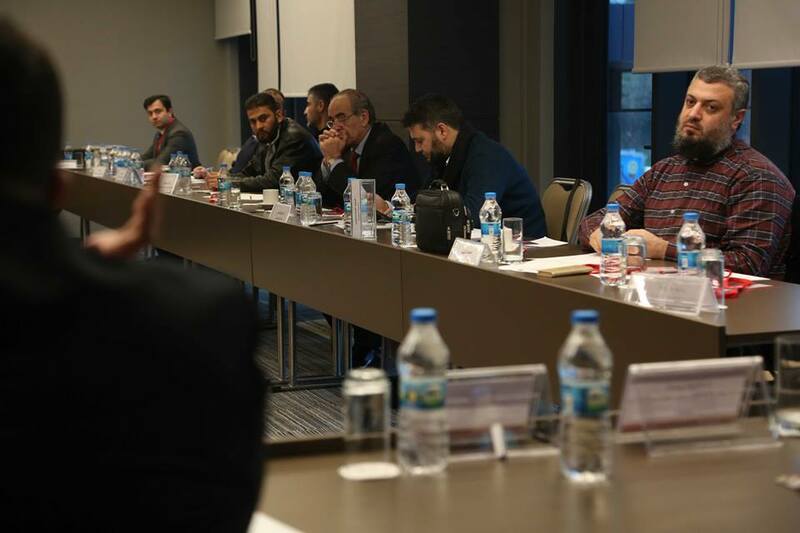 Furthermore, the Syrian coalition had not been able to make any progress in the political context during 2017. The emergence of the “Rescue Government” in Idlib Province during the last quarter of 2017 has caused the end of the “Syrian Interim Government” (SIG) projects and activities in the province. 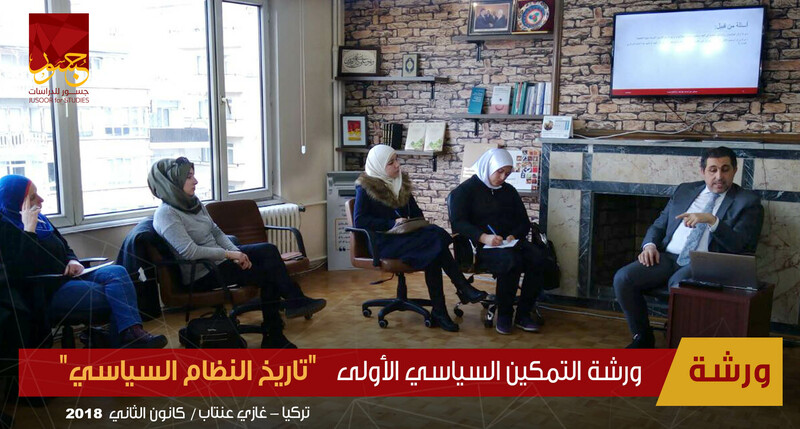 In addition, the Rescue Government forced restrictions on the movement of SIG’s ministers in Idlib, which practically meant that the SIG has lost its largest presence in the area in addition to its capability to convince supporters of its effectiveness. During 2017, the course of Geneva has witnessed the holding of four rounds, the largest number of rounds ever held by the course in one year. However, those rounds did not make any significant progress and were practically limited to confrontations and arguments between the regime and opposition delegations, alongside unsuccessful attempts by De Mistura to reach points of agreement between the two parties on what needs to be discussed or excluded from discussion. However, the overall course this year has faced two main challenges: the first one was originated from the Capital of Kazakhstan, which embraced a parallel course under the auspices of the most influential actors on the ground in participation of the military factions. This course was able to bring about concrete changes on the ground, whereas the course of Geneva had not been capable of the same due to the lack of necessary mechanisms. Also, the invitation to the Sochi conference took place after the final round of Astana Negotiations, and was considered a declaration of a new political trajectory that poses a direct threat to the course of Geneva, especially due to the fact that the sponsors of the Sochi conference have the ability to impose military and political solutions on Syria. The second challenge had been the decreased interest of international actors in the Geneva course, most notably the U.S and the EU, who both decreased their representation to the minimum, and halted any form of pressure on Moscow, which left the Syrian opposition with limited choices, with refusal or withdrawal remaining its last cards for negotiation. The year 2017 is considered a year of successful outcomes for actors, which came as a result of accumulated work during the past years. During this year some actors were able to achieve concrete gains as opposed to others who notably where not able to perform as well. 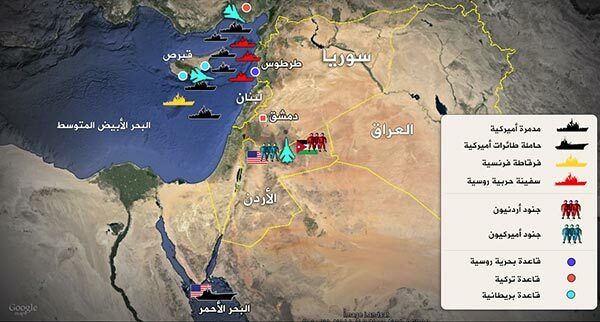 In addition, the military map of influence has changed considerably during this year. Many observers think that 2018 will be the year of political outcomes, where actors who have already made progress on the ground will seek to turn their achievements into political agreements that can present economic gains in the upcoming years due to the reconstructing process in Syria. Foreseeably, the course of Astana Negotiations is expected to continue and may reach concrete outcomes that can provide stability and ceasefire in certain zones. 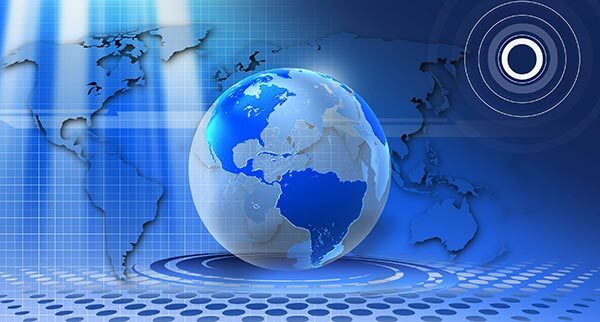 The Sochi Conference that will be held by the end of January 2018 could become the beginning of a new political course, that may witness the disappearance of the regime and opposition duo, which had characterized the course since its beginning in 2012, in addition to the absence of the international actor, especially the U.S to the benefit of the three regional actors: Moscow, Turkey and Iran. If the Sochi conference will achieve a political breakthrough of any kind, or a change in the Geneva course itself, the latter will face the danger of being ended or redirected towards becoming a common ground for agreements originating from Sochi and Astana, rather than being originated by the Geneva course itself. At the time where ISIS is facing its imminent defeat, 2018 is expected to witness further tension between the PYD and Assad forces that may result in the end of the truce between the two parties, that had been effective since 2012 until now. However, the end of the truce does not necessarily mean that Assad’s forces in addition to Iran can end the presence of the Kurdish Self-Governance Administration or even reduce its influence. This scenario would largely depend on the American stance from the Kurdish Administration in addition to whether the U.S. will continue in supporting the Syrian Democratic Forces after the end of the war on ISIS or not. It will also depend largely on whether the U.S will grant the Kurdish Administration a political cover that would prevent it from being targeted by the regime or from any other party. The situation also depends on the Turkish stance, as the Kurdish administration would face a severe crisis shall Turkey choose to lead a military offensive against the Kurdish areas in coordination with Iran, in parallel to a similar military offense from regime supporting forces. It does not seem however, that the Syrian opposition will be able achieve any breakthroughs on the ground or on the political level during 2017. 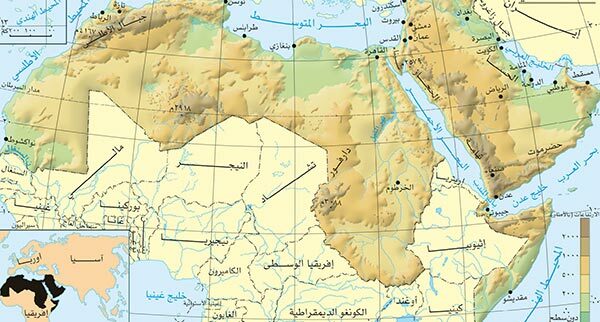 Its military influence might face partial declination in some areas, but it will maintain its influence over its main military points, due to the international consensus rather than its military power.